The American Museum of Natural History houses what many people consider to be the finest crystallized azurite in existence. 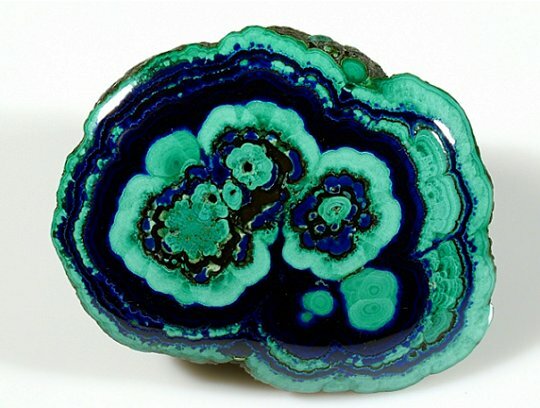 The Newmont azurite measures about a foot across and has individual crystals up to 8 inches long. Originally used by a miner to pay off a few hundred dollar bar tab, the specimen was soon after acquired by the Newmont Mining Company and brought to New York. I remember going to their office and hoping to somehow acquire the specimen, but it was already too well known and was fully appreciated. It was donated to the museum in 1977 with an appraised value of $250,000. Today it would be worth much more. In fact, an attempt to purchase the specimen for $10,000,000 was made in 2000, but the offer was declined. Very rarely seen are the wonderful stalagmites of azurite and malachite from the early years of mining in southern Arizona. These are the most beautiful of all polished azurites. In1884, a few magnificent pieces were found at Morenci, and Kunz illustrated one of these in his Gems and Precious Stones. I was recently lucky to acquire the best of these. The specimen, which is illustrated here, measures 2.62 inches across and is remarkable not only for the perfect form but also for the great number of agate like fortifications. It is also the only complete stalagmite known to me, the few remaining examples all being slices.